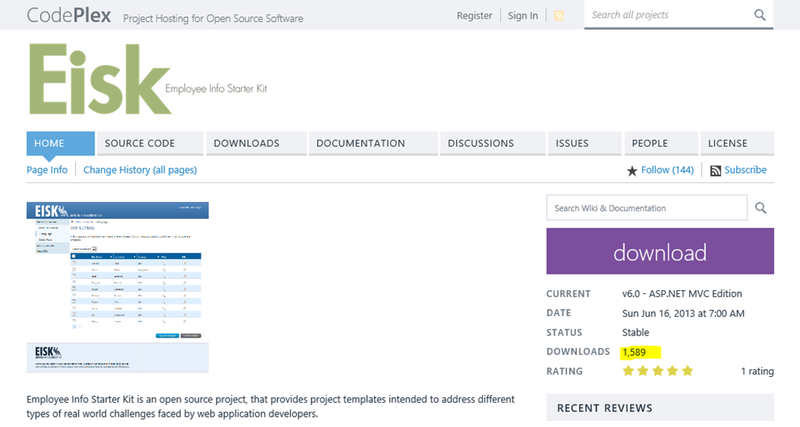 We are very excited to share that Singapore ASP.NET/IIS MVP Mohammad Ashraful Alam has released a new version his open-source project Employee Info Starter Kit (EISK) last week, and it has already started gaining attention in the community. To date, it has gathered 1,589 downloads. That’s not all! Microsoft Channel 9 has also featured this project on it’s current episode of it’s most popular weekly show – This Week On Channel 9 (TWC). Ashraful Alam is very excited about his project and he shared with how he got it started and what keeps him going. In last couple of months I’ve been working for the next release of Employee Info Starter Kit, my open source project which have been creating a huge influence in Microsoft developer community for last few years. Since its first release, this open source project gained a huge popularity in the developer community and had 250K+ combined downloads. This starter kit is honored to be placed at the official ASP.NET site, along with other asp.net starter kits, which all are being considered as the “best” ASP.NET coding standards, recommended by Microsoft. The earlier release v5.0 of EISK was also showcased in Microsoft’s Channel 9’s Weekly Show. Thank you Ashraful Alam for your wonderful contribution to the community! ← Upcoming Offers From MS Press!